Consumer expectations have evolved greatly over recent years. With more competition and the battle between in-store and on-line, retailers have a tougher job when it comes to making their brands stand out. In order to stay relevant, the modern retailer has to bring more to the table than product alone. It has to bring EXPERIENCE. To accommodate for experience within retail design, a new model is fashioning which includes characteristics that fall uncannily similar to that of the hospitality market. Modeling off of hospitality, there are concepts that can be integrated within retail design to accommodate the modern consumer, with focus on experience, branding and destination. Offer a dynamic experience. As retail dynamics change, the interaction within brand environments needs to be looked at differently. Within hospitality, environments are becoming multi-purposeful to accommodate for diversity. Consider this same idea within retail. What if the environment were to morph in order to offer areas for shopping, education, entertainment and interaction when needed? Think past product alone and there are product launches, special events and evolving offerings. These are all opportunities for a destination that integrates unique solutions to tell a story while engaging consumers on a deeper level. Sometimes that story takes an unexpected turn. 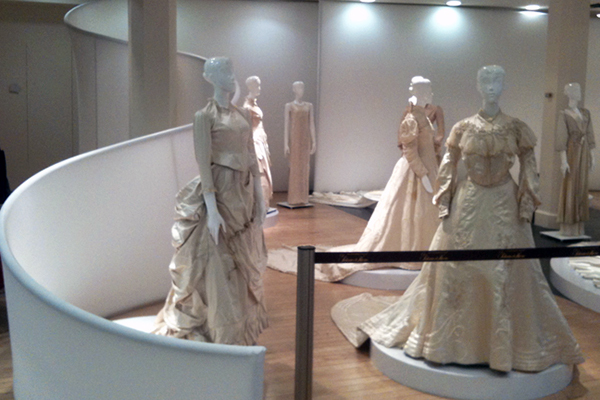 For example, Palacio de Hierro, a fashion retailer, launched a special event to showcase historical fashion. The event allowed consumers to step away shopping and experience the beauty of historical garments within the store. The environment was separated with mobile partitions, which enabled the space to easily transition back to the original form at the conclusion of the event. Go beyond wayfinding. 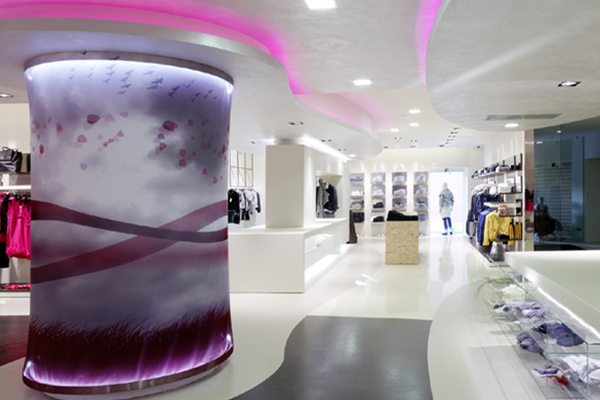 There are certain aspects of retail which often remain in place as permanent features, such as wayfinding. These navigation opportunities can influence the shopping experience and consumer connection to the brand. By taking the predictability out of the signage and considering architecture that enhances the product areas, a new level of context is formed. This can be achieved through architectural form that pulls on material or graphical enhancement. Chedraui showcased this design mindset at their Guadalajara, Mexico location. 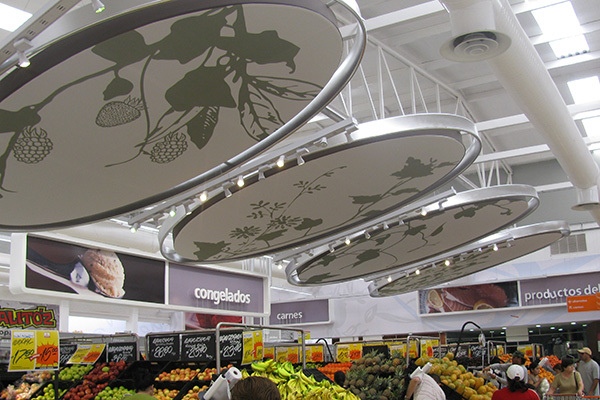 The wayfinding is subtle yet effective, using large shapes and graphics to guide the shopping experience. The result is clean and modern, pulling more on hospitality-like ambiance than typical wayfinding. Define with materials. In his article, Why Brand Building is Important, Scott Goodson states “Brands are psychology and science brought together as a promise mark as opposed to a trademark.” In retail, every aspect of the experience has a psychological effect on the consumer, from the layout to the lighting to the architecture to the materials used to dress the space. When integrated effectively, the material selection defines the retailer personality and creates visual engagement and tactical interest with the consumer. Take for example the graphic element designed for Eliseo. This element was created using a layering of textiles, varying in transparency and graphic placement, to create a three-dimensional art piece that also acted as a changing room. The material selection spoke to the classy and feminine personality of the department and enhanced the destination-like quality of the retail environment. Destinations offer an opportunity to escape. It is a quality that hospitality has thrived in creating and guests have flocked to experience. As retail continues to change, the strengths which have propelled hospitality environments are making their way to retail design. What hospitality has taught us is to place focus on the consumer by creating an environment that caters to the customer, rather than focusing on product alone. The dynamics of the environment, the architecture and the materials used go a long way in achieving this objective.